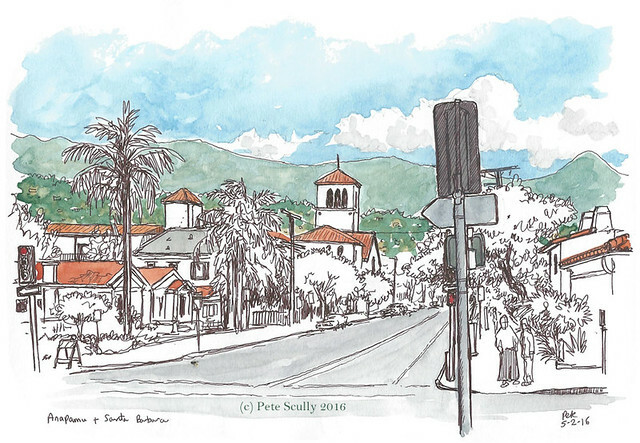 I was in Santa Barbara for a conference, but arriving the night before meant I had most of the day before check-in to do a bit of urban sketching around town. The tourist office pointed me in the right direction, up State Street towards the Courthouse. Off I went. There were interesting shops up there too though, and I spent a good deal of time mooching around Paper Source before finally hitting the Seawhite of Brighton sketchbook. Yes, I’m rotating books; I just finished Moleskine 14 the day before, so now I’m o a Seawhite (#4) and after that I will crack open the Stillman and Birn Alpha. Gone are the days of consistency but they all still line up on a shelf (I keep them in shoeboxes actually). Hey, want to know what my sketchbooks look like? I’m exhibiting them at the UC Davis Design Museum this Fall! Anyway back to Santa Barbara. Above is Anapamu Street, looking towards the mountains that give this city its backdrop. 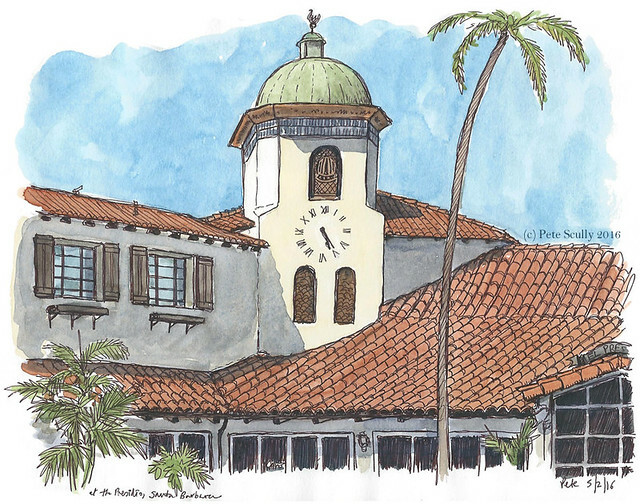 There are a lot of red tiled rooftops in Santa Barbara. 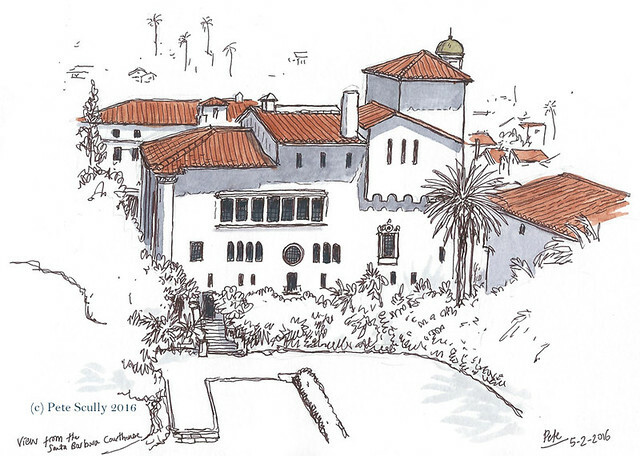 The Santa Barbara courthouse (above) is lovely. The current building was completed way back in 1929 just before the stock market crash and has an amazing interior, particularly the Mural Room. The website of the Courthouse is here. It surrounds a pretty garden square, where I sat and sketched the above. One passing couple joked that I can leave out the scaffolding in my sketch, but they can’t in their photos; trues, but I didn’t, I just hid it behind a tree. No leaving out important details in my urban sketchbook! I finished up my juice smoothie (still had the smallest hangover from the previous night at the James Joyce) and explored the building, climbing the tower (taking the elevator, that is) and getting the most amazing views across Santa Barbara. It was windy, and there were a fair few tourists crowding the platform, but I did manage one sketch, below. I had lunch at a Belgian/Bavarian sausage/beer restaurant called Brat Haus (I do recommend) and watched Spurs implode to a 2-2 draw with Chelsea handing Leicester their deserved title before heading out to sketch more. This below is at the historic Presidio area, a block or so off of State Street. There were lots of wineries around. I considered doing some wine tasting, but then I considered not, and did some sketching instead. Wine tasting is really something to do with others, I feel. You can’t nod appreciatively and make discerning faces at yourself when tasting wine alone. You can’t pretend you have a palette for wine when there’s nobody to show off to. You can just say, “I like this label, where is the bathroom, no I might come back later”, and then go and sketch. I’m sure the wine tastes great. I sketched this as the day got later (that clock was totally wrong by the way, it was only like 3pm), and went and sketched one more which I will save for next time (it’s not anything special, I’m just pacing them out). Yeah, I hadn’t expected to see the game at that time. I was going to catch up with it back at the hotel, but there it was on TV in the restaurant, so I had to watch. Tough viewing! 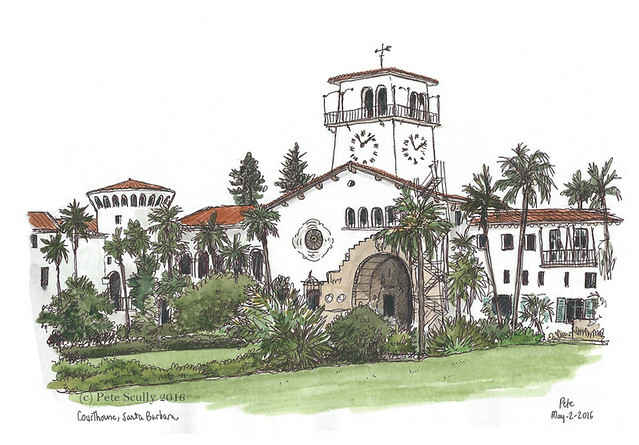 How lovely to see Santa Barbara through your eyes, beautiful sketches.